Hypoxia has challenged the homeostatic physiology and survival of cells, tissues, and species over many millennia of evolutionary time. As such, it is not surprising that a brief hypoxic “challenge” serves as a powerful preconditioning stimulus to induce a wide variety of epigenetic changes that promote a transient, robust period of enhanced resistance to injury. 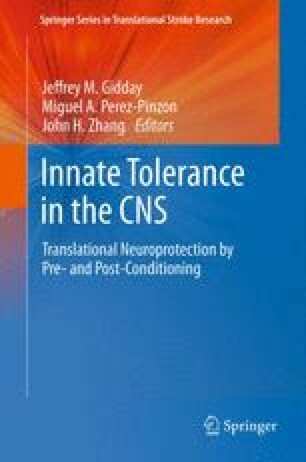 Evidence for such “tolerance” is particularly strong in the central nervous system, with hypoxic preconditioning (HPC) paradigms affording both the adult and pediatric brain powerful protection from ischemia and other pathologic insults. In this chapter, we review in vivo and in vitro HPC models and what is currently understood regarding the molecular-genetic basis for the observed protective effects, from the signaling pathways inducing the gene expression changes in response to the hypoxic stress to the effectors that account for the injury-tolerant phenotype. Despite relatively intensive investigation, and the identification of several “hypoxia-mimetic” approaches to pharmacologically induce cerebral ischemic tolerance, the precise mechanisms and mediators of this phenomenon still require considerably more elucidation. We close with a translational perspective highlighting the identified strengths and weaknesses that characterize HPC-induced tolerance, the target subpopulations of patients that could potentially benefit from HPC, and the preclinical studies still needed going forward to help propel HPC-based stroke therapeutics from bench to bedside.